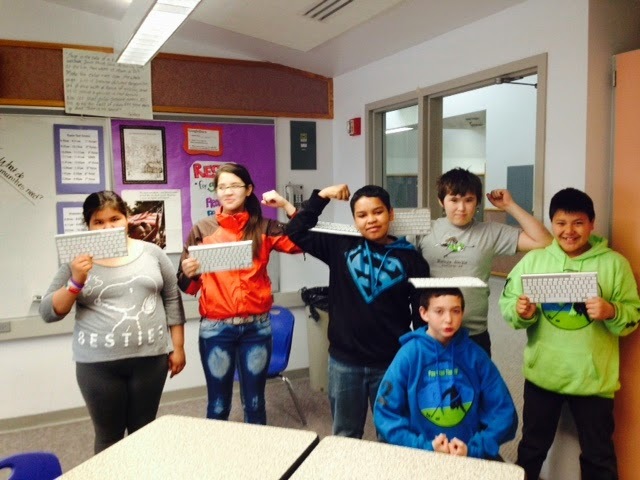 The Weisz Teacher's Blog: Kings of the Keyboard! This year the 6th grade technology class has been busy learning many different apps and web tools. They have also spent the first 15 minutes of class all year learning to keyboard. Our top keyboarder currently is Chase typing a rapid 45 words per minute, but most of the class is on his heels, regularly hitting the 30 words per minute mark and speeding up every day! 6th graders have learned to use various apps such as Keynote, iMovie, Pages, Comic Life, Blogger and many others. All of the 6th graders have their own class blogs (see the right side of this blog for links to student blogs). 6th graders have also read several books this year in which they were able to incorporate Minecraft and collaboratively build worlds based on their reading comprehension. These have included Jack London's To Build a Fire, The Giver by Lois Lowry, and Bridge to Terabithia by Katherine Paterson.